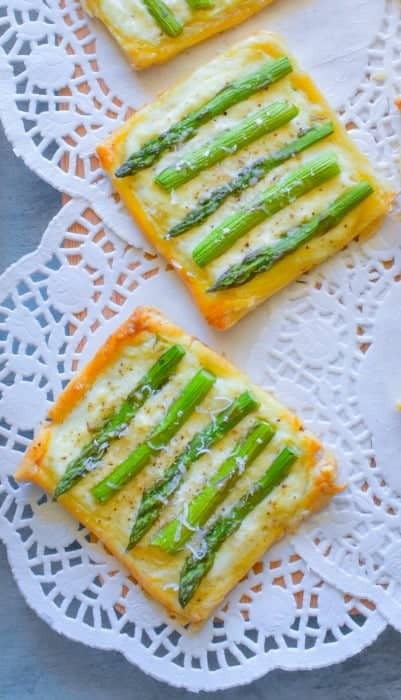 Asparagus and Ricotta Tarts: Absolutely delicious and flaky tarts that are topped with a creamy mix of ricotta, cheese and lemon along with tender asparagus. This recipe makes 8 large tarts. 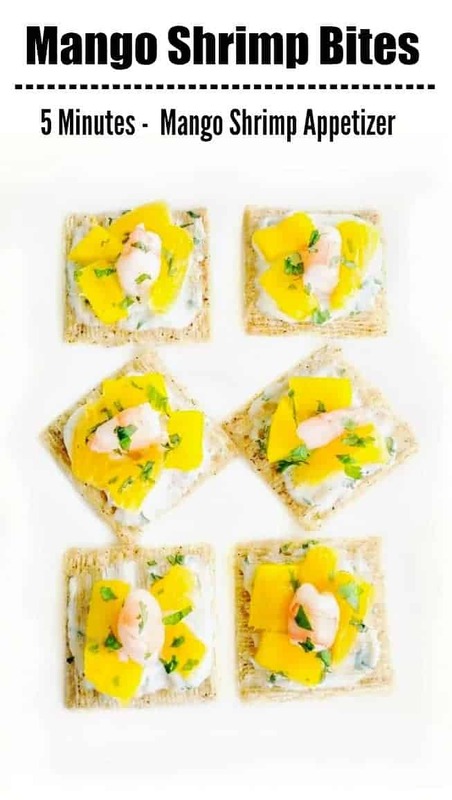 Baked to golden perfection, they make an excellent party snack or just a quick nosh. 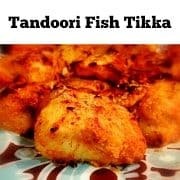 They are extremely easy to make and can be prepped a night before. 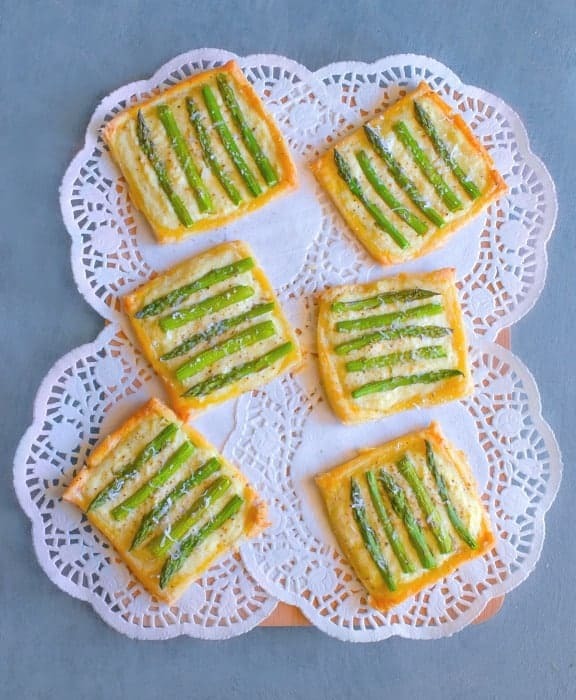 This Asparagus and Ricotta Tarts is my favorite way of eating asparagus and pair it with a chilled wine for that perfect summer party snack. 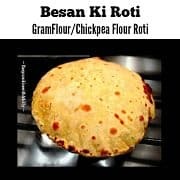 I’m so excited to share this easy peasy recipe with you’ll today and it seriously is extremely easy to make. I actually made them yesterday for an evening ‘Wine+Snack’ get-together with our new neighbor. We have actually interacted a couple of times in past 2 months but never got a chance to invite them over until yesterday. During our random conversations on the streets, we came to know that they love wine and music. And I was even more excited to have them over as we love wine+music too (Yessss, I’m so excited cause they are a really friendly couple and our age). So, I decided to make these Asparagus and Ricotta Tarts and a cheese platter too. 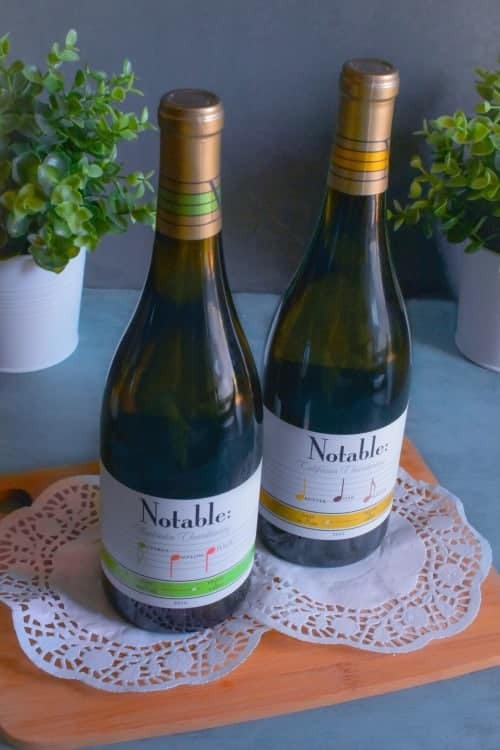 While I was shopping for the ingredients at my local store, I came across these Notable Wines and they highlight the wine’s flavor profile on the front label using musical notes as visual tasting cues. * Oaky & Buttery Chardonnay: a full-bodied Chardonnay, with the flavor notes of Butter, Oak, and Vanilla. * Fruity & Crisp Chardonnay: crisp, zesty Chardonnay, with vibrant flavors of Citrus, Melon, and Peach. 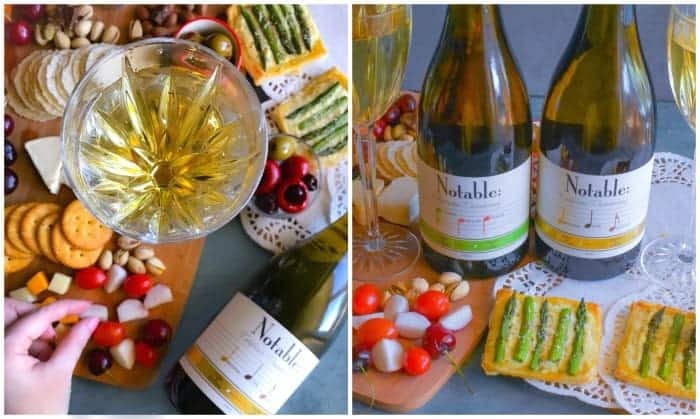 Since we love both these flavors, so we bought both the wines along with the cheese platter ingredients like cheese, olives, nuts, and fruits (no meat as they are vegetarians). 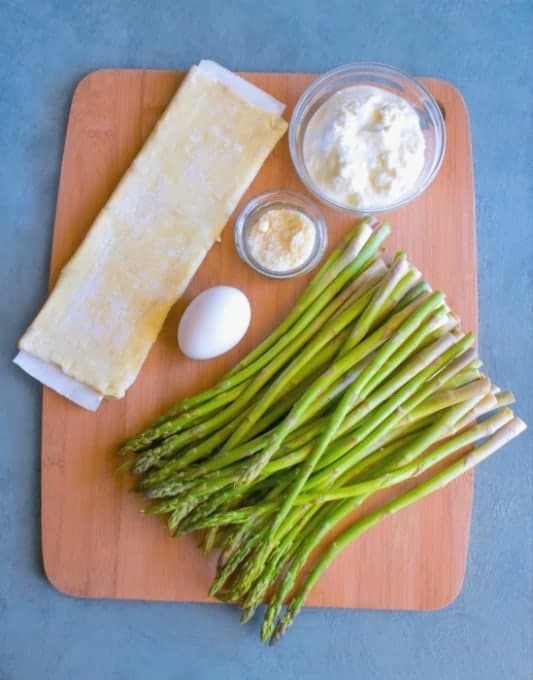 Now, the fun part, preparing these gorgeous golden tarts and all you need is a thawed puff pastry roll, fresh asparagus, ricotta, cheese, eggs. 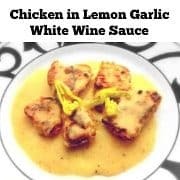 These are the major ingredients and you can add additional flavors like herbs, lemons, different cheese and even meats. 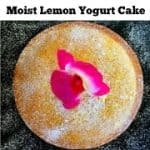 I’m not adding lemon as the wine already has a citrus flavor and these buttery flaky tarts would go perfectly with them. 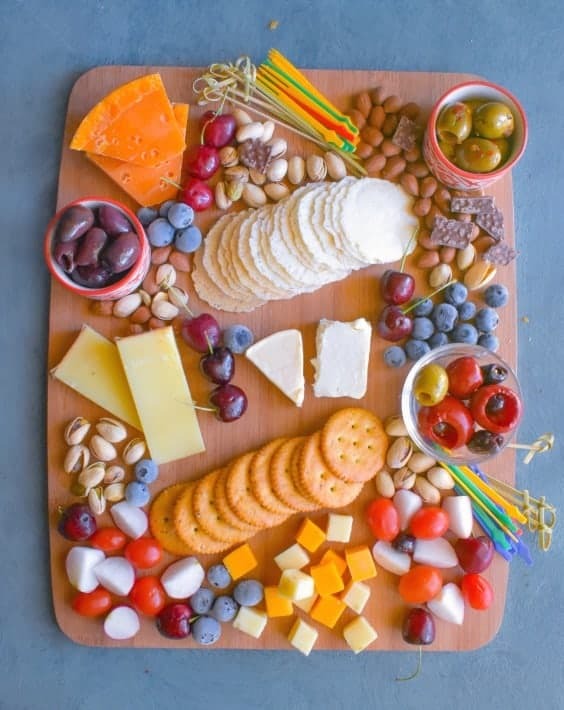 We actually had the most fun assembling the cheese platter as it was a mix of ‘D’ and my favorite things to nibble. Cheeses: Swiss cheese, American cheddar, French Mimolette & Comte, Feta. We actually made the cheese platter 5 minutes before our neighbors arrived as I wanted the cheese to stay as cold as possible till then. 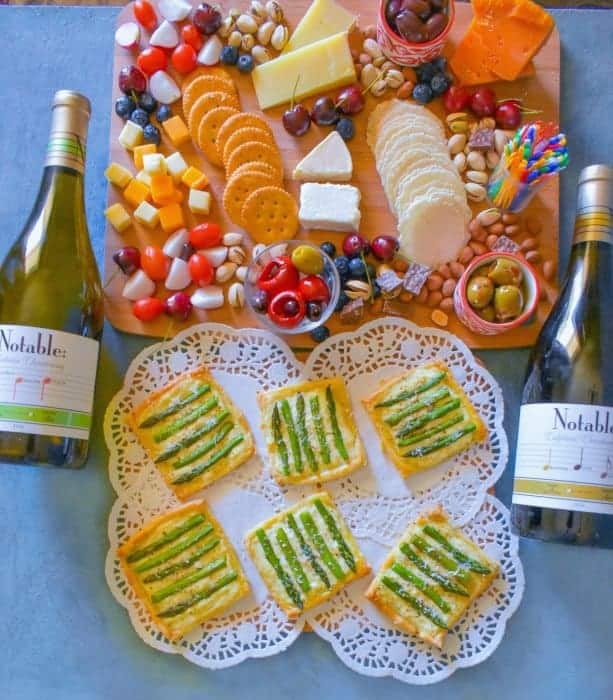 The Asparagus and Ricotta Tarts took 20 minutes to make and the wines were already chilled…. The evening was a lot of fun and we discussed a lot about music, theater and turns out we’ll are going for a local music-in-the-park night soon. So, I’m really glad we did this impromptu meetup as it’s always so good to know your neighbors. And actually be able to bond with them. We are definitely looking doing more of such get-together. Both these Notable Wines were a huge hit too and we have decided to stock more of them on our next store visit. 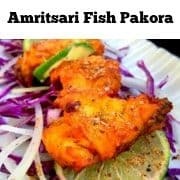 I highly recommend you to give them a try and you can even find them on Facebook & Instagram. Notable is also the 1st wine that highlights the flavor profiles on the front of the bottle. Here’s a quick glimpse of our tarts before they went into the oven. 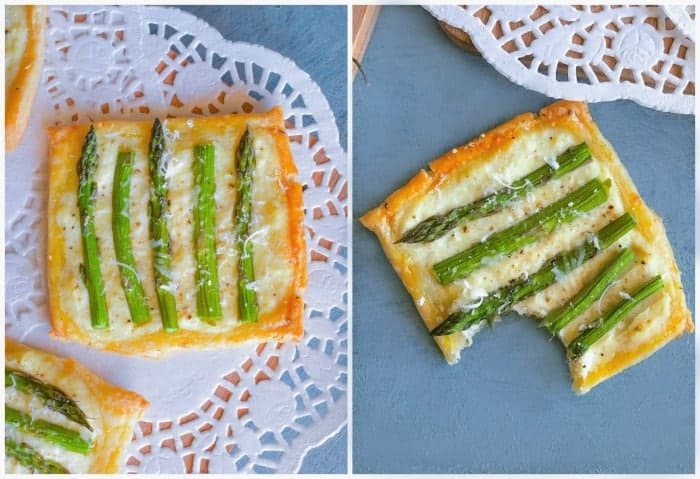 Asparagus and Ricotta Tarts: Absolutely delicious and flaky tarts that are topped with a creamy mix of ricotta, cheese & lemon along with tender asparagus. Preheat - Heat oven to 400°F and place oven rack in lower third of oven. In a large bowl, mix ricotta, cheese, salt and egg (leaving 1tbsp of egg in the bowl). 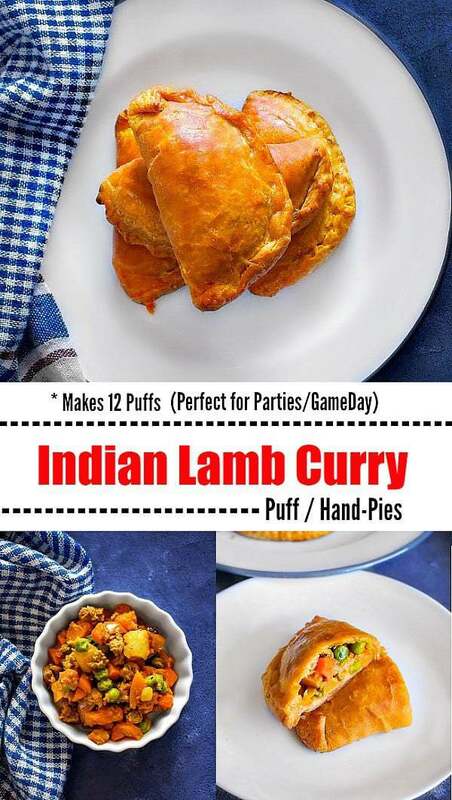 Unfold the pastry onto a piece of parchment paper or foil. Roll 1/2" bigger on all sides. Slide the paper/foil (and pastry) onto a baking sheet. Now, divide the pastry sheet into 8 equal square. Lightly brush a 1/4" border of egg around each of the 8 pastry squares. Add the 1 Tsp of ricotta mix on each pastry square and spread it to cover the square leaving the edges. 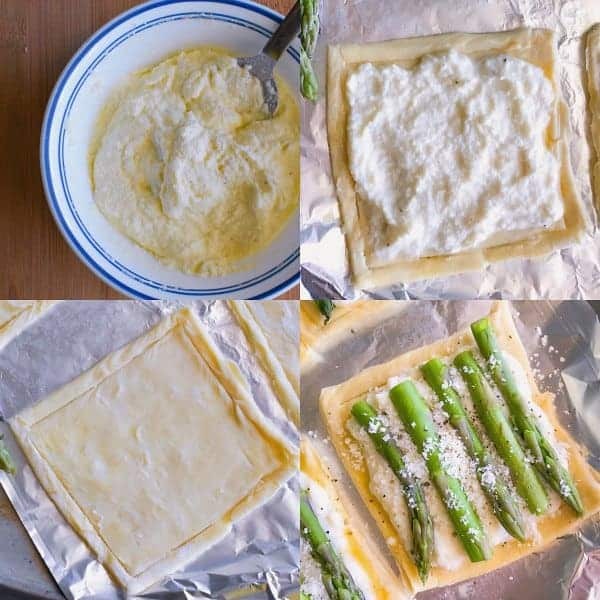 Top each pastry square with the asparagus (fits 5 stems) and drizzle olive oil on each. Bake until the crust is golden brown, 18 to 20 minutes. Turn off the oven and transfer the tarts to a serving plate. Sprinkle some grated cheese and pepper on each. 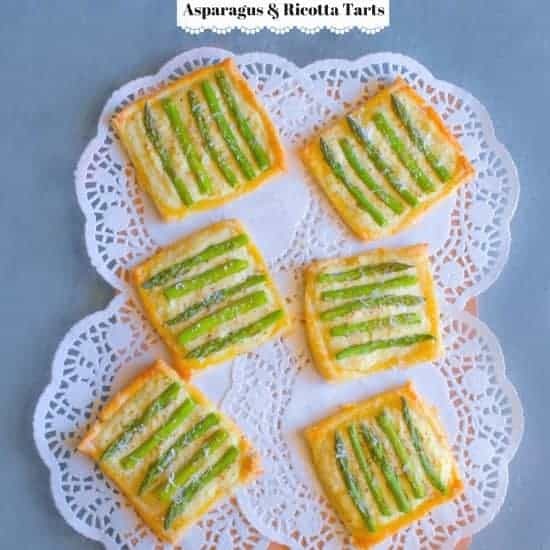 1 Reply to "Asparagus and Ricotta Tarts"
These are so dainty and cute – and I LOVE how easy this is to multiple and make a large batch for a crowd!